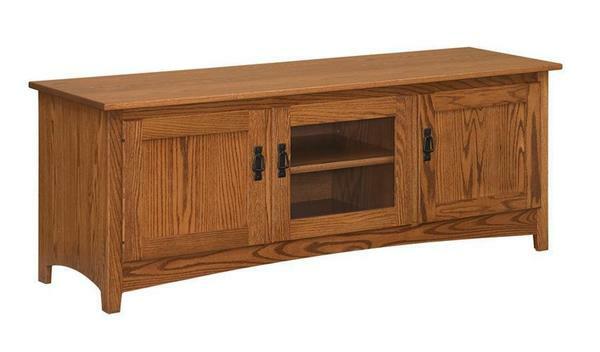 Your beloved television deserves a lovely stand like our Amish 66" Country Mission Plasma Stand. A clean, mission-style design works with a variety of design styles. Meauring 66" wide, this stand includes three doors (two wood and one with a glass panel). Behind each door sits waits an adjustable shelf ready to hold gaming systems, your cable box, DVDs, and more. Custom options include wood type, finish, and hardware, as well as the option to add a 6-lite Mission glass panel to the center door (see custom options for image).